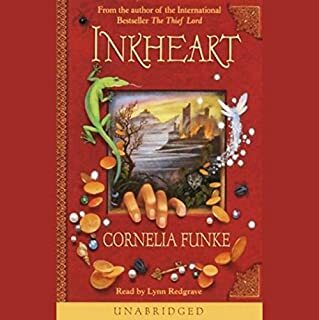 I listened to Inkheart with my children ages 6 and 9 on a cross-country trip this summer and we all loved it, a journey within a journey. The characters are wonderful and the story is well written. There are definitely some intense moments which are on the dark side for the younger audience, as well as some slower paced sections that might not entertain the shorter attention spans. The plot is intriguing and terrific for all book lovers, adults and kids alike- although having said this, kids with experience in complex and lengthy stories will like it the best (ones who can listen to or read Harry Potter for example.) Overall an enjoyable listen, Lynn Redgrave's voice is made for reading aloud, and highly recommended!